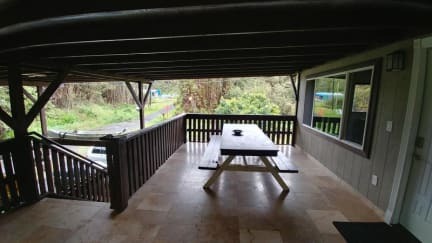 Located outside of Hilo in a tropical rain forest, Volcano Rainforest Hostel is a perfect place to get away from the city and explore Hawaii's beautiful nature. A hidden getaway in the middle of the Pacific. Our reception is open until 9pm but security is 24 hours. Parking is available. Aloha - Only 15 Minutes from Hawaii's #1 destination, Volcano National Park. 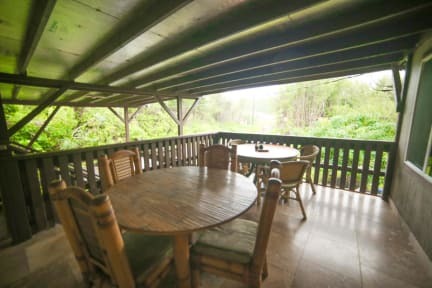 Volcano Rainforest Hostel is surrounded by the Big Islands upcountry rain forest. Lush jungle, large Ohia trees and Hapu'u ferns surround the property. We have comfortable rooms available. Each room at Volcano Rainforest Hostel has its own private entrance. The kitchen has dual sinks, granite countertop island and is very spacious. Relax on the terrace. Taxes not included - 15.00% (TAT and GET). Reception / Management is 9am to 9pm. Security is 24/7.